As the headmaster of Benfleet Secondary School, Bert Evans woke up to the job of catering for thousands of refugees who had lost their homes. 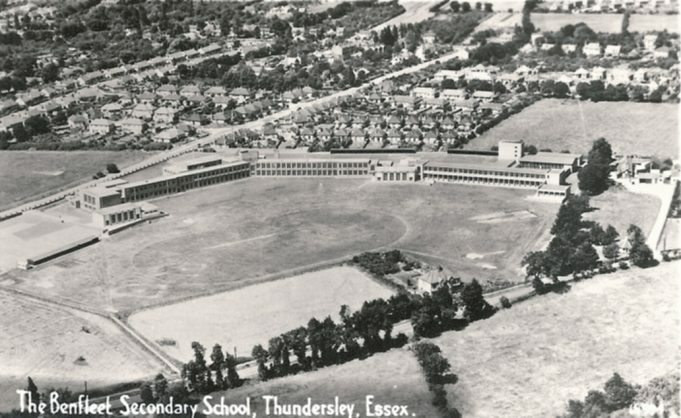 Now The King John School in Shipwrights Drive, Thundersley, it was the main evacuation centre for those forced to flee their homes on the night of January 31st, 1953. Mr Evans, who died in 1973, received an MBE for his hard work and the events of that night and the following weeks will never be forgotten by his son. David, who was 14 at the time, still remembers when the terrible news started filtering through. …the headmaster was only told there had been a “little bit of flooding” and it took him hours to discover the full extent of the tragedy. He said, “My first recollection was being woken up before dawn, it must have been about 4.30am, by the phone ringing. My dad went to answer it and then I heard him talking to my mother. I got up to go and find out what was happening and he said he had been asked to open up the school. As it was the school’s opening was delayed and for four weeks the building was home to hundreds of families who had lost everything except the clothes they were wearing and who had nowhere else to go. But in the early hours of February 1st, the headmaster was only told there had been a “little bit of flooding” and it took him hours to discover the full extent of the tragedy. David, now 64, said; “Dad knew it was much worse than they were telling him and he thought the emergency services were trying to play things down. He phoned the police and they tried to fob him off but eventually one of the senior officers admitted they were evacuating Canvey. “At this point dad started phoning round members of staff to see who could come in and help out – he knew there was going to be a lot to do. He called in Betty Finch, the domestic science teacher, who did a marvellous job providing food for everyone. “During that first day we must have had around 4,000 people coming through the school’s doors and they were all cold and hungry and wet. 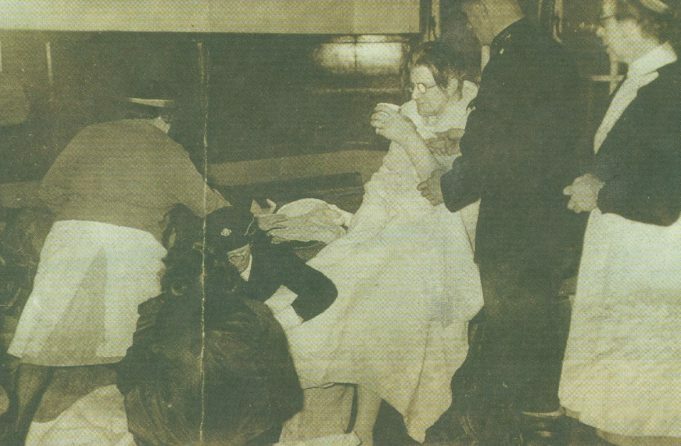 Many people had been roused from their beds and were still in their pyjamas – they were tired and freezing cold. “The number of people coming in was incredible. “Betty did a fantastic job providing them with cups of tea and bread and butter while dad called in male members of staff to move furniture about. I was just the gofer, running around trying to find different things that were needed, I was using my energy going around trying to find people and making sure everyone who came in had registered. “My dad had arranged desks in alphabetical order to try to keep track of people so everyone who came in had to give their names to someone sitting behind a desk. “Even then there was quite a bit of confusion as people came off the island, came to the school and then found relatives and left without telling us. “At one point it was thought several hundred people had died because no one knew where they were but the truth was a lot had gone and found other accommodation. “During the day I actually saw some of my school friends who lived on Canvey. At that time I hadn’t fully realised the significance of what was happening and I told them I had been up since 4am. They told me that at 1am they had been on the roofs of their houses, freezing cold, waiting to be rescued. Throughout the Sunday volunteers continued to pour into the school to help out – members of the Women’s Voluntary Service and the Army arrived bringing with them blankets and bread and butter. Meanwhile, teachers went round to local shops and asked them to open up so they could get hold of tea, sugar and other basic food stuffs. …we had to give the shopkeepers receipts and promise them payment at a later date. David, of Kingswood Chase, Leigh, said “When the first people started coming in we could only give them a cup of tea and some bread and marge but as time went on we were able to provide them with proper meals. “But it took quite a lot of organising. 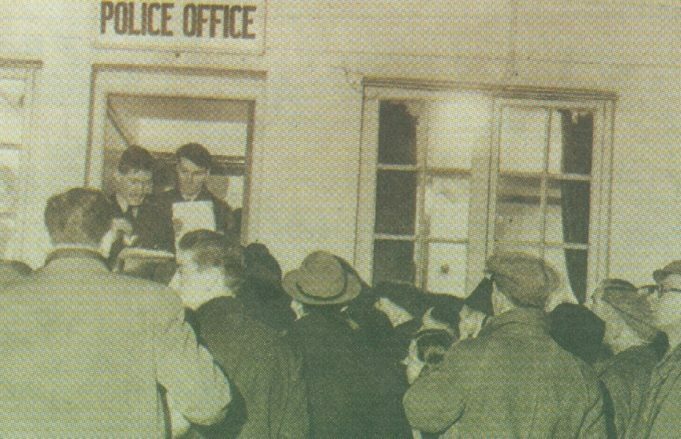 In many cases we had to go and get the local shopkeepers out of bed so they could open up and as no one had a lot of money on them at the time we had to give the shopkeepers receipts and promise them payment at a later date. “We had hoped the money would come from somewhere at some point. Big companies also offered to give us food to help people, although some firms thought we were making an order and tried to charge us! “But on the whole everyone was very generous. They all wanted to help. For four weeks the people of Canvey, who had once owned bungalows and houses, were forced to camp out on mattresses in classrooms while lessons started up again and school carried on around them. “Several classrooms were closed off for people to live in and lessons carried on as normal. It was quite strange in a way but everyone coped as best they could,” David said. Island doctors did their bit for the elderly and the sick. 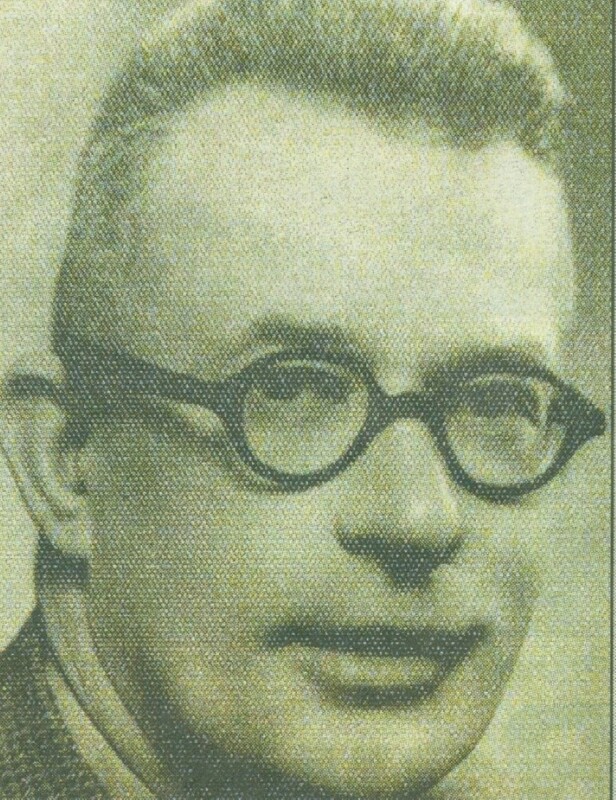 Dr Linter, a Czech refugee who had fled Czechoslovakia during the Second World War, arrived at the school and asked Mr Evans if there was somewhere he could set up a surgery. David said: “Dr Linter told dad most of his patients were at the school and could he operate there. The supplement that this article was taken from was given to us by Mrs Alice Chafer, to whom we extend our thanks. It is an exact transcription, including photos, from the Echo supplement dated Wednesday, January 29 2003, which was part of a commemorative weekly pullout. 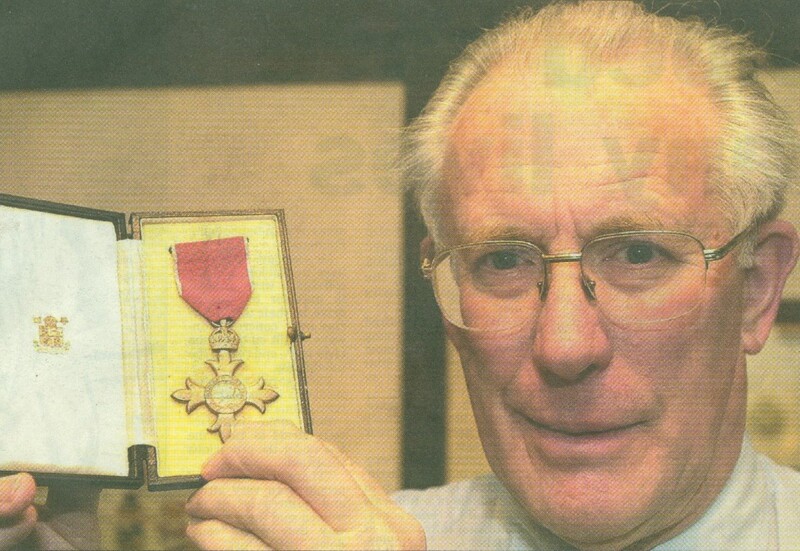 Proud son, David Evans holds up the MBE awarded to his father Bert, a headteacher who realised things were worse than they were led to believe. High Anxiety - people queue for information about loved ones. Misery - a telephone box, a caravan and houses, seen in the background, are submerged by flood water. My apologies for the last posting since it was not Dave Evans who drove his Dad’s car but Mark Ballard who drove his Father’s Wolseley . Dave Evans was the member of the athletics club who organised an excellent Hadleigh Olympiads reunion (The club was sadly disbanded in the 1970s) held some 10 or so years ago in Shipwrights Drive at what I think was still called Hollywood Country Club. This also brought back memories for my wife and I as we had our wedding reception there in 1969. Although my wife attended his school, I knew Mr Evans by name only. She also witnessed the dreadful flood from her house on the top of Vicarage Hill. I ran for Hadleigh Olympiads from about 1965 to 1972 and thanks to Mr Evans’s on going generosity, he would occasionally loan his big Wolseley car to his son, Dave. We could pack in 6 runners and their gear and drive at up to 90 miles per hour to road and cross country events! I remember the floods of Canvey Island well. My friend Barbara Flauherty lived there and I went up to the school to look for her among the evacuees. I didn’t find her, but ended up taking a young couple and their toddler home. Barbara died two years ago, but I am still in touch with Joyce Jaggers, Mary Finch and Mary Veale from the school. The last time i met headmaster Mr Evans, affectionately known as Fritz by us pupils at King John school because of his Germanic crewcut hairstyle, was about 1970 while on holiday in Seefeld Austria. What surprise me was that he recognised and remembered me as a pupil from King John School which I had left twelve years earlier. I had previously thought of myself as a insignificant pupil of thousands that had passed through that school. How wrong I was! Mr Evans was a unforgettable man of outstanding qualities RIP Fritz.